If you're an ardent Schwalm embroidery enthusiast, then you probably may have already paid a visit to Luzine Happel's Schwalm embroidery website . 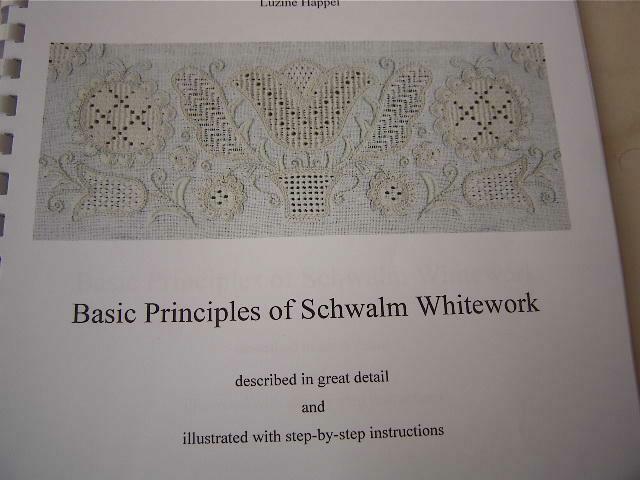 Luzine Happel is well known in the embroidery world for her work and books on Schwalm Embroidery .You can read the reviews of a couple of her wonderful books, Basic Principles of Schwalm Whitework, and Early Schwalm Whitework, here and here. Since her books are self published, they are usually not found in online stores and the order had to be placed through mail. But now she has come online with her website http://www.luzine-happel.de/?lang=en . Today, courtesy Luzine , I am giving away a copy of Basic Principles of Schwalm Whitework .This book is a superb resource for anyone planning to learn Schwalm embroidery. You can read my review of the book here. All you have to do is leave a comment here in this post answering this question - Have you done Schwalm embroidery or any kind of white work before? Would you prefer adding colors of your choice to the white work stitches or would you stitch it as it is, in white? The giveaway is open to all till Jan 28th.I'll announce the winner here in this blog on the subsequent day. In case you prefer purchasing a copy of this book rather than try your luck,please visit Luzine's shop . So, ladies..let us see who's the lucky one!!! I have done some whitework but not Schwalm Whitework. I like the look of all white embroidery. I have schwalm whitework on my list of things to learn and do. I like the look of white on white and I'd begin my stitching that way. Knowing, however, that I love colour, I wouldn't be a bit surprised if some colour, especially in subtle variegated threads, made their way into future stitchings in this style. I have been a schwalm embroiderer for a number of years, and find it so satisfying. I have not worked it in colour as I think the stitches and textures of the whitework speak for themselves. I only have one book on Schwalm, and a folder of designs I have been given, so this book would be a wonderful addition to my bookshelf. Schwalm embroidery - I never attempted. I have done white work using chikankari stitches. I would rather leave the white works white as they look beautiful that way. Adding colors to white work is not my idea. Although colors are good when used in different works. What a beautiful book, great inspiration. I love white on white. I've done some basic whitework and cutwork, it would be lovely to expand that. I've done whitework but not tried Schwalm Whitework. I love to experiment with colours as they give a very different and a nice look.. I have wanted to do whitework for quite some time. My mom used to do it, but alas...I've waited too long as she is no longer able to teach me. I love the white on white, but I am willing to try colors. I would love to win this book as my budget won't allow a purchase at this time. I have embroidered with white, but not in the traditional sense of 'whitework'. Schwalm looks so intriguing and it's definitely on my list of want-to-try's at some point. I'm sure the techniques will translate into colour work too. Although I have only done a couple of small pieces of whitework myself, I have collected it for many years. Now that I'm retired I have time to learn Schwalm work and have no learning materials. I think colour adds a new dimension to any kind of whitework, and is easier on the eyes for those who have difficulty with white on white. For me, though, nothing equals the elegance or subtlety of white-on-white. I have done a couple of small pieces of whitework embroidery. While I was working, I collected whitework. I haven't done Schwalm work but it is on my list of "to do" now that I'm retired. I think the addition of colour is lovely, but not traditional, and this is traditional needlework. For those who want to use colour instead of white, and for those who have difficulty seeing white on white, I see nothing wrong with using colour. For me, though, nothing equals the elegance and subtlety of white on white. Its lovely to see the pictures you have posted on white work.but yet i didnt try any white work. i came to know abt that from your site.i have browsed for Schwalm white work and found lot of interesting designs. doing in colour is good while with good combinations. white is good eventhough color always colorful..
some one is lucky to grab this book. All the best to everyone who has post comment. I have done some basic embroidery over the years and have done lots of chicken scratch embroidery...have been attempting to learn other types of embroidery. Thanks for the giveaway. Wishing you a great weekend crafting up more beauties. I have never done white work before however I have admired the white work pieces done by my grand ma.Once I learn this technique, I would like to experiment using different colors, as I love various hues around me. I forgot to mention my email id in the comment I left. Schwalm is beyond my skills, but I love white embroidery. I think that white on white is very elegant and gives a feeling of preciousness. I am really excited about this book giveaway! I have done Chikankari through Anita's stitch-along but never attempted Schwalm. I love white on white, but I also love the look of white on ivory/cream. Schwalm is on my bucket list. I've done whitework and it's one of my favorite form of embroidery.I'd like to use only white because I feel there are many styles where we can use colors and there is no need to do the same here.Thanks a lot Deepa and Luzine for the opportunity to win this fabulous book. I've stitched some whitework projects: traditional Lithuanian whitework - adinukė, and Lithuanian drawn thread embroidary - peltakiavimas. I like traditional white on white stitching, but sometimes I do it in colours. I like whitework on dark natural linen or stitching, when linen and thread is of the same colour. Who knows, maybe I'll be lucky to try Schwalm embroidery using this great book. Thank you for your generosity. The white looks so elegant. Hi Deepa,I would like to have this book,I did only chicken embroidery using white thread,but in future I want to use colours in this.